The NFL pulled the grass rug from under the feet of people betting on the most anticipated game of the season. Oddsmakers closed and then reopened the football betting line on the Kansas City Chiefs (9-1) vs. Los Angeles Rams (9-1) Monday Night Football game after the NFL announced the league would be moving the game from Mexico City to Los Angeles. Bovada currently has the Rams as a 3.5-point favorite over the Chiefs with the over/under set at 64 points. Before the announced, the Rams were a 2.5-point favorite with 63.5 points set as the over/under. After pictures the field conditions surfaced on social media on Monday, several players for both the Chiefs and Rams voiced their concerns and many considered not playing in the game. 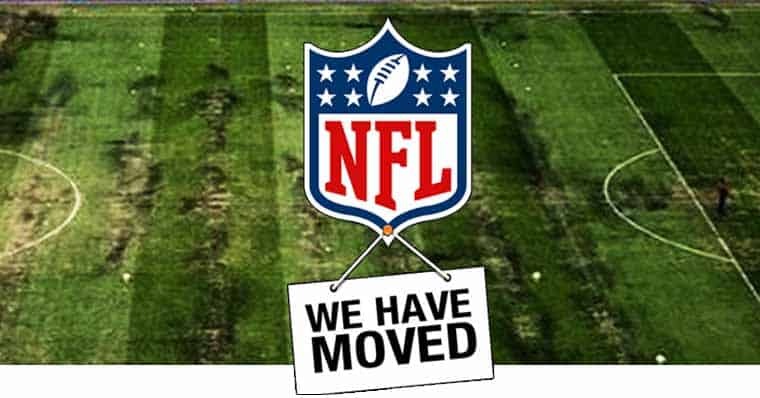 The NFL would then announce on Tuesday that the league would be relocating the game to L.A. due to poor field conditions. NFL rules state the home team, the Rams for this game, in an international matchup must make its home stadium available should the game have to be moved for any reason. On Oct. 11, the Estadio Azteca held a Shakira concert and left the field in tatters with large trenches of dirt found all over the playing surface. The league made trips to the stadium to determine the quality of the field and officials had deemed to it to be safe. However, Mexico City experienced an unusual amount of rainfall in the past couple of weeks, worsening the condition of the field as a result. The NFL turf testers examined the field for a final time on Monday and raised concerns with the league about whether it would be safe to play a professional football game on the field. Both teams and the ESPN MNF broadcast team will need to need to adjust their schedule and prepare for a game in Los Angeles – in less than a week. The Rams had been training in high-altitude in Colorado to prepare for the game in Mexico City which would have had an elevation of nearly 7,300 feet. The team has elected to stay and will return to L.A. on Saturday. Tickets for the game went on sale on Tuesday night, and the NFL will soon announce the refund policy for the Mexico City. The Rams will be providing thousands of complimentary tickets to first responders and people in the community affected by the recent wildfires and mass shooting tragedies in Southern California. The Chiefs-Rams game is now scheduled to be played on Monday, Nov. 19, at 5:15 p.m. PT, 8:15 p.m. ET, at Los Angeles Memorial Colosseum and will air on ESPN.